Ethics, an essential dimension of human research, is considered both as discipline and practice. For clinical research, ethically justified criteria for the design, conduct, and review of clinical investigation can be identified by obligations to both the researcher and human subject. Informed consent, confidentiality, privacy, privileged communication, and respect and responsibility are key elements of ethics in research. A systematic literature search of English-language articles on Medline, ISI web of knowledge, Sciencedirect, Google scholar, the Cochrane database of evidence-based reviews, and the Database of Abstracts of Reviews of Effects was performed by connecting the Mesh terms (“ethics”, “medical research”, research ethics”, “medical education”, “research ethics principles”. The abstracts of 461 articles were reviewed for the relevancy of topic and analyzed in terms of application and validity. Out of these, 21 studies were found relevant as they concentrated principles of ethics in medical research, their practical applications, and suggested guidelines for future research. Research ethics committees must promote greater understanding of ethical issues on biomedical research. These committees function for submission, consideration, evaluation, and communication of findings. Application, research protocol, patient information leaflet and informed consent form, and any other supporting documentation are thoroughly reviewed by research ethics committees for legal and moral safety, integrity, and welfare of the research subjects. Background: Differentiating the different follicular derived lesions from each other can be challenging. Although immunohistochemistry is generally accepted as a useful ancillary technique in the diagnosis, controversy exists regarding the best marker or combination of markers to distinguish each lesion from its mimics. In this study, we aimed at evaluating multiple markers to compare their sensitivity and usefulness, and to find out if a combination of the evaluated markers can be of additional value in discriminating thyroid lesions. Methods: The study included two groups of follicular derived thyroid lesions. Immunohistochemical evaluation of CD56, HBME-1, Gaectin-3 and CK19 was done for the two groups. The sensitivity and the specificity for each marker and their combination in the diagnosis were calculated. Results: Each studied marker was sensitive and specific for certain thyroid lesion but the sensitivity and the specificity were increased when two or more markers from the panel were used together. Conclusions: Although no single immunohistochemical marker by itself is completely sensitive and specific for follicular thyroid lesions, the combination of CD56, HBME-1, Gaectin-3 and CK19 attains high sensitivity and specificity in differentiating follicular derived thyroid lesions. Occupational exposure to toxic heavy metals renders the industrial workers with various health problems. Many heavy metals act as endocrine disruptors. Chromium salts are commonly used in industries as asbestos brake lining, cement dust and food additives. Thyroid is a metabolically active important endocrine gland. Little is known about the toxic effects of chromium on thyroid. So, the aim of this study was evaluation of the histological changes induced by chromium on thyrocytes and the possible protective role of vitamin C. Forty adult male albino rats were divided into four equal groups: control group, vitamin C treated group, potassium dichromate treated group and the fourth group co treated with potassium dichromate and vitamin C. Potassium dichromate was given intraperitonially for 2 weeks at a dose 2mg/kg daily. Vitamin C was given at a dose 120mg/kg orally daily for the same period. Specimens were processed for light and electron microscopy. Apoptosis was evaluated immunohistochemically. 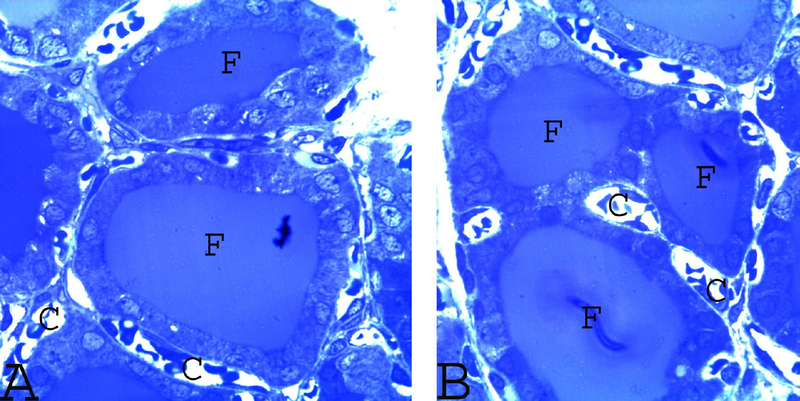 Specimens of potassium dichromate group showed disturbance of the normal architecture of the gland with coalescence and degeneration of thyroid follicles and desquamated cells in its lumen. Disruption of the apical and basal membranes of some thyrocytes, flattened hyperchromatic nuclei, dilated RER and swollen degenerated mitochondria were also noted. 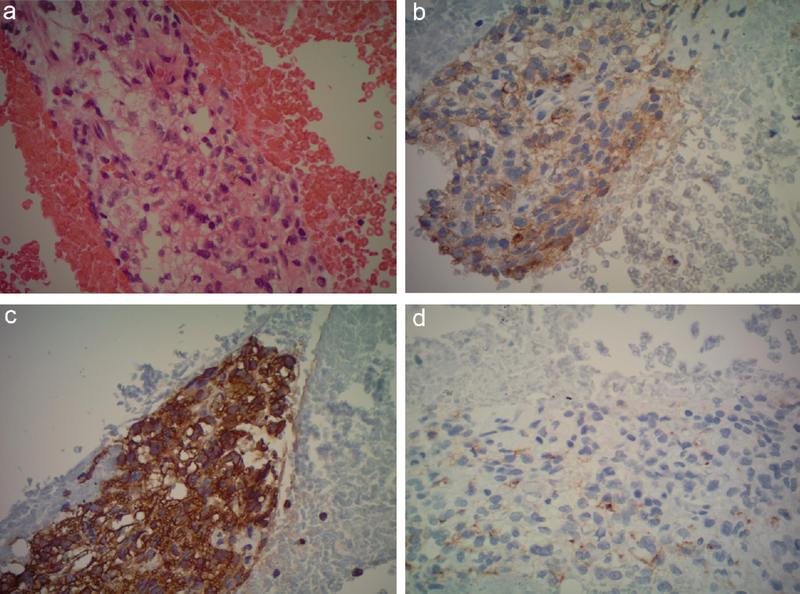 Immunohistochemically, there were changes in the immune expression of Bcl2 in the cytoplasm of thyrocytes. Vitamin C supplemented group showed partial improvement of the previous changes. So, potassium dichromate induced structural changes in the thyroid follicular cells that were partially improved by vitamin C supplementation. Many studies have reported high prevalence of hypogonadism amongst the diabetic patients suggesting the therapeutic benefits of testosterone hormone administration to these patients. The present research was carried out to study the possible role of insulin, testosterone and combined insulin and testosterone therapy on the diabetic rat ventral prostate. Fifty-eight adult male albino rats were used and divided into 2 main groups; the control and the experimentally induced diabetic group that given a single intra-peritoneal injection of STZ (60mg/kg). The rats with confirmed DM were subdivided into: diabetic group that kept without treatment, diabetic–testosterone group (100 mg/kg/4 weeks, S.C.), diabetic–insulin group (5IU/day/rat, S.C.) and diabetic–insulin–testosterone group. After 8 weeks, the ventral prostatic lobes were dissected and processed for paraffin blocks to study the epithelial height, mast cell number, expression of AR, PCNA and active caspase-3. DM induced a significant decrease in mast cells number, epithelial height and androgen receptors (AR) with a significant increase in the apoptotic index. On the other hand, the epithelial cells showed a non-significant change in the proliferation rate compared to the control group. Treatment with testosterone induced a significant increase in the epithelial height, number of mast cells & AR positive epithelial cells and a non-significant increase in PCNA with a significant decrease in the active caspase-3. Treatment with insulin showed abundant mast cells in the stroma with a significant increase in epithelial height & AR with decrease in active caspase-3 positive cells and insignificant changes in PCNA. Combined treatment with both hormones produced similar outcomes to the group treated with insulin alone. It was concluded that diabetes leads to alterations in rat ventral prostate gland. Early insulin treatment attenuates these effects with preserving most of the measured parameters within the normal values. Furthermore, addition of testosterone to insulin did not seem to produce a significant therapeutic add. α-Chlorohydrin (ACH) is a well-known food contaminant, has shown anti-fertility activity in males. In this research we studied the histological and immunohistochemical changes in the epididymis of adult albino rat. Twenty adult male albino rats were divided into control (group 1) (10 rats) and experimental (groups 2 and 3) (10 rats). The experimental rats received α-Chlorohydrin at a single oral dose of 100 mg/kg body weight. After 6 h (group 2) and 24 h (group 3) of ACH treatment, the specimens were submitted for the light, electron microscopic and β-tubulin immunohistochemical evaluations. Light microscopy after 6 h showed focal separation of lining epithelium, while EM examinations showed dilated rER, and Golgi complex. After 24 h LM demonstrated different stages of cell exfoliation; however, EM proved multilamellar bodies and dilated rER besides the granules. Immunohistochemi- cal examinations revealed decreased reactions in experimental groups. However, the mean total optical density of the β-tubulin immunostaining revealed statistical nonsignificant difference between the three groups. Thus ACH as an undesirable unavoidable food contaminant induced rapid histological alterations on caput epididymis with duration-dependent manner at the level of the cell and tissue, that puts another obstacle on the road of fertility. The cell block is an ancillary technique used in cytology to increase the diagnostic accuracy in the analysis of effusions and aspirations. In our laboratory, we implemented the routine use of the Thromboplastin-Plasma Cell-Block (TP-CB) technique because it is simple, reproducible and has low cost. The aim of this prospective study was to proof the utility of performing routine cell blocks in non-gynecologic cytology by comparing the diagnostic concordance, cellularity, and contribution to diagnosis from paired TP-CB and Conventional Cytological (CC) preparations. For this, all non-gynecologic specimens including effusions, body fluids and aspirations, were collected for an 8-month period. A total of 179 TP-CBs were prepared from the remaining fluid following CC preparations. Absolute concordance was found in 81.6% cases between both techniques (κ = 0.56). The cell block aided the diagnosis in 28% of cases and ICC studies were done in 12%. The use of routine TP-CB complements and enhances the diagnostic accuracy of CC, allows the performance of ancillary studies and improves the diagnostic approach and treatment. 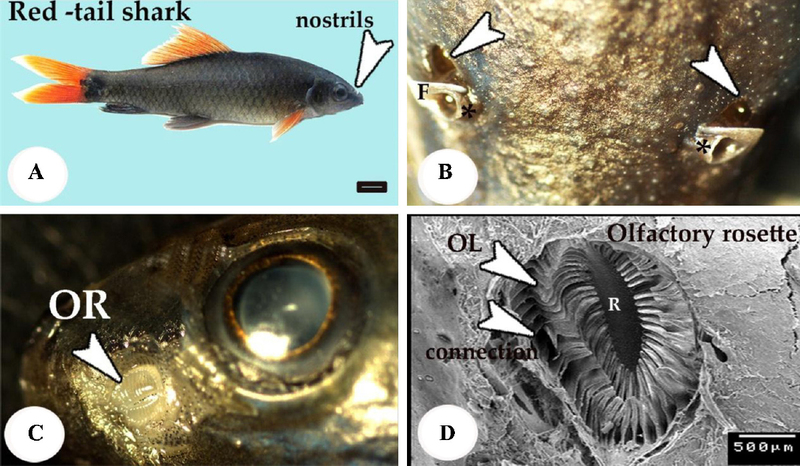 Olfaction plays a major role in various life activities of fish. 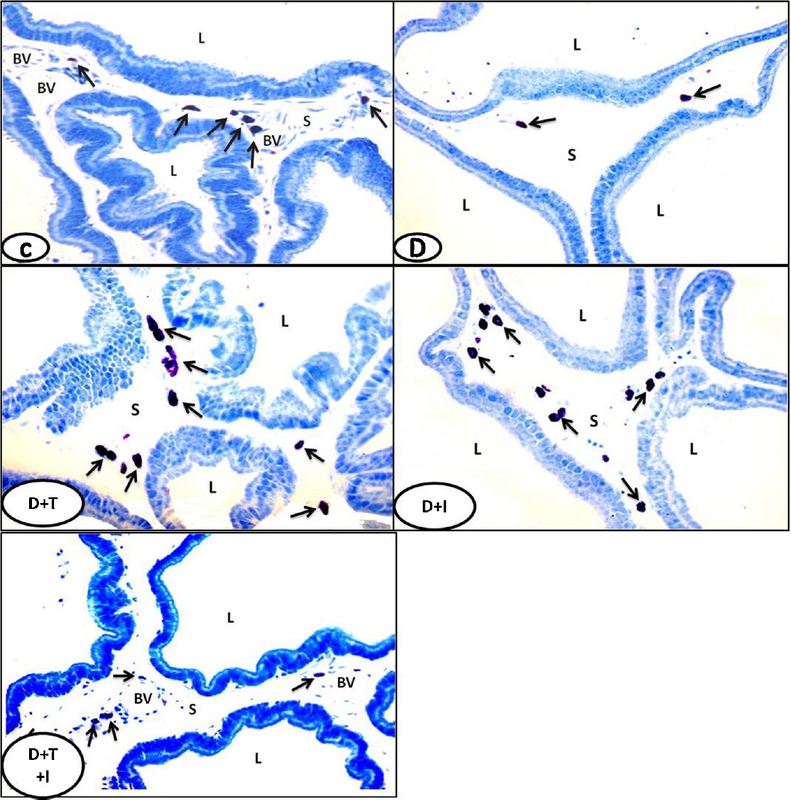 The present study describes for the first time the gross morphology, histology, histochemistry, surface architecture and ultrastructure of the olfactory epithelium of Red-tail shark. It possessed a pair olfactory rosette, connected to the external by two nasal openings. The olfactory rosette was oval in shape, consisted of 45,48 lamellae. The lateral surface of olfactory lamella is covered with sensory epithelium, whereas the non-sensory area restricted mainly at the margin of the lamellae. Sensory epithelium contained ciliated, microvillous olfactory receptor cells (ORCs), crypt and rodlet cells. In addition to the presence of basal and microvillous supporting cells. The non-sensory epithelial cells were consisted of rodlet cells and stratified epithelium. The later was divided into ciliated and non-ciliated cells. Neuromasts were found in the apical third of the lamellae. Histochemistry of the olfactory epithelium revealed presence of PAS-positive granules in cytoplasm of rodlet cells were, while the ruptured ones stained strongly with PAS, AB and Sudan black B. The apical portions of supporting cells were stained with PAS and AB. Grimelus Silver method showed positive reaction of ciliated, microvillous ORCs, crypt and rodlet cells. Red tail shark seemed to have an acute sense of smell and depend mainly on the olfactory organ in detection of food and this study is important for future studies on behavior of this species. The functional significance of all olfactory epithelial cells was discussed with special references to stages and role of rodlet cells.